#AAFPNC 2013 Attendance Record: So What? Whoa!!! Dr Henley: "We've reached a record 1017 student registrants today @aafpnc" Rocking the #FMRevolution here in the house!! Last week was the 40th anniversary of The National Conference of Family Medicine Residents and Medical Students by the American Academy of Family Physicians. Kudos to AAFP for grouping the twitter feeds in Day One, Day Two, and Day Three. The facebook account was also active. They also did well expanding into instagram photos and videos. They even had an app for the meeting! You'll see from the tweet above that there was record student meeting attendance this year. Three months ago, there was record attendance at the AAFP National Conference of Special Constituencies (another advocacy and leadership meeting). In addition, the Academy enjoyed membership greater than 110,000 as of Spring 2013. AAFP FMIG Network needs to crank it up a notch: How is the AAFP going to establish relationships and follow-up with the record 1017 student attendance to the meeting? A key difference between when I was a student and how is social media. Social media is a tremendous opportunity for the national organization to keep in touch with the grassroots medical student organizations through facebook, twitter, instagram, webinars, and other platforms. Don't lose the momentum that was started last week. Congratulations to all those newly elected national student leaders! But now, your first test in leadership is to establish relationships with your grassroots constituents and to bring the energy and excitement from The National Conference to the local medical student campuses. State Chapters need to tap into resident members from meeting: State level chapters are struggling to gain and maintain new members. What a tremendous opportunity for the state chapters to try to establish and maintain relationships with their Family Medicine Resident members. Residents have distinctly different needs than students. And, I think, that state level chapters are in a position to do some outreach with potential future state leaders. 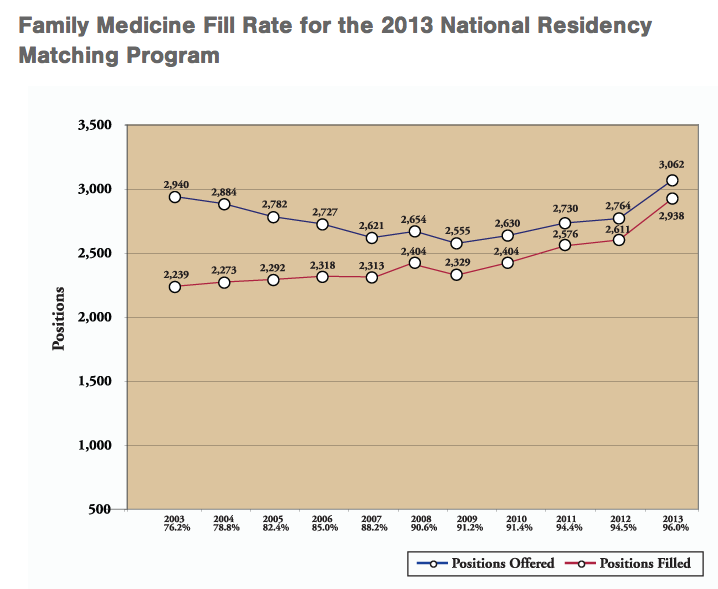 It's all about the Family Medicine Match: To those outside the Family Medicine community, the only statistic that matters is on Match Day 2014. Can the Family Medicine community convert record attendance at this year's leadership meetings into Match Day success? Well, we have 228 days to work our hardest to make that happen. I don't pretend to know it all, and I don't pretend to have all the answers. What I do know is that I've been around Family Medicine leadership and Family Medicine advocacy for a number of years. I graduated medical school when Family Medicine's numbers were better. I've also seen when match numbers slid, and I am hopeful with the numbers over the past couple of years.